I HAD THE OPPORTUNITY to talk to Arnold Palmer the week before Thanksgiving. In a telephone interview (he was in warm Orlando and I was in chilly Virginia), we covered a handful of topics, including the 1960 U.S. Open at Cherry Hills. This year marked the 50th anniversary of Arnold’s famous (and lone) U.S. Open victory, considered to be one of the greatest ever played. Arnold charged by 20-year-old amateur Jack Nicklaus and 47-year-old Ben Hogan, who still had plenty of game but faltered on the final holes. The 1954 U.S. Amateur champion, Arnold turned professional and joined the tour in 1955. His first of 62 PGA Tour wins came at the 1955 Canadian Open. Following is a portion of our conversation. ARMCHAIR GOLF: When you came out as a rookie, who were the players that you really admired and looked up to? ARNOLD PALMER: I think Nelson and Hogan and Middlecoff and Mangrum and Snead. ARMCHAIR GOLF: There were a bunch of good players, weren’t there? ARNOLD PALMER: Yes, there were. ARMCHAIR GOLF: I wonder if you remembered Harvie Ward? ARMCHAIR GOLF: He was at North Carolina, wasn’t he? ARNOLD PALMER: That’s right. The first time I played Harvie Ward, he shot 67 and I dusted him 5 and 4. ARMCHAIR GOLF: What kind of player was he, Arnold? ARNOLD PALMER: He was a great player. He was a good friend and a great player. ARMCHAIR GOLF: That’s what others have told me, too. And he continued to compete as an amateur but I’ve had people tell me that he was one of the best players in the world as an amateur in the mid 50s. ARMCHAIR GOLF: I wanted to ask you what life on tour was like when you first came out. I talked to Rossie [Bob Rosburg] a couple of years ago before he passed. He said he traveled with you and there was a lot of camaraderie and it was just a whole different scene back then. Can you tell me a little bit of your impressions of life on tour back in the 50s? ARMCHAIR GOLF: It was not an easy thing to do, was it? ARNOLD PALMER: No, it sure wasn’t. It was tough. ARMCHAIR GOLF: I look at purses where the total purse was 15, 20, 25 thousand dollars. ARNOLD PALMER: Hell, there were only 15 money places on the tour. At every tournament, the max was 15. And 15th was $100. So, you think about that. And if you won and it was a pretty good tournament, you won $2,000. ARMCHAIR GOLF: That was a different era, for sure. There was a nice celebration at Cherry Hills this past summer to celebrate the 50th anniversary of your [1960 U.S. Open] win there. Can you tell me what that was like for you? ARNOLD PALMER: It was wonderful. I’m trying to think who all was there. Some of the guys that played in the Open were there. Cherry Hills did a wonderful job of putting on a big affair. The membership was sold out. We talked about the Open and some of things that happened. It was very nice. ARMCHAIR GOLF: You probably remember quite a bit about that Open. 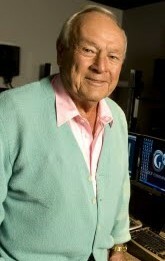 ARNOLD PALMER: I wouldn’t say I could give you all the details, but I remember some of things that happened. I thought I played pretty well for three rounds and nothing happened. I was just sort of in limbo. Then the last round, it all happened. ARMCHAIR GOLF: I’ve gone over that front nine you shot on the fourth round, where you birdied something like six out of the first seven holes. I know you shot 30 on the front nine of that final round. ARMCHAIR GOLF: Do you remember when you reached that point where you thought I’m right in this and I can win it? ARNOLD PALMER: In those days, I kind of played like I could win whatever, from anywhere. And I played a little bit that way. ARMCHAIR GOLF: Do you think you were a little bit more focused and a better player when you played from behind? ARNOLD PALMER: Let’s just say I never ruled out the possibility of winning. Until it was figuratively impossible, I always thought I had a shot. ARMCHAIR GOLF: I think you were playing right behind Hogan and Nicklaus during that final round. ARNOLD PALMER: Yeah, you’re right. ARMCHAIR GOLF: You saw Hogan hit into the water on 17? ARNOLD PALMER: I did. I was standing in the middle of the fairway when he hit into the water. ARMCHAIR GOLF: And then you were probably thinking a couple of pars and you’d be in pretty good shape. ARNOLD PALMER: I knew that I had a shot if I didn’t screw up the last two holes. ARMCHAIR GOLF: Did you like the golf course? ARNOLD PALMER: Cherry Hills? Very much, yes. ARMCHAIR GOLF: And 280 ended up winning the Open, after all, Arnold. You did it. You seriously get to talk with all of these people!? Talking to Arnold was definitely a huge highlight. You don't just call him up. Others helped make it happen.